Puerto Banus is an upmarket resort located six kilometres to the south of Marbella which was built by Jose Banus in 1970. The resort began as a marina with a shopping complex and has become one of the largest entertainment centres on the Costa del Sol. The nearest airport is Malaga International Airport which is sixty kilometres or forty miles away. To the north of the resort is the famous resort of Marbella while to the south you will find the resorts of San Pedro de Alcantara and Estepona. Puerto Banus is a popular tourist resort attracting close to five million tourists annually most of which come from northern-Europe especially from the United Kingdom as well as the very wealthy from Saudi-Arabia and Kuwait. Are you an expat in Puerto Banus? What do you like/dislike about it? Let us know in the comments box at the bottom of the page. Puerto Banus is a resort to see and be seen and mix with the extremely wealthy. The focal point of Puerto Banus is its marina with close to 1000 berths, the King of Saudi-Arabia has his luxurious yacht moored there. Behind the marina are a variety of bars, pubs, restaurants and boutiques. Here you will find some well known names such as Chanel and Christian Dior. 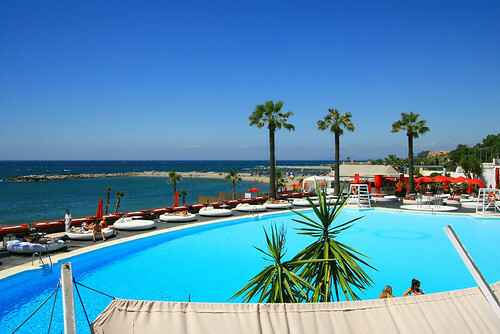 Puerto Banus is located in the heart of the “Costa del Golf” with an abundance of golf courses. The Monte Paraiso resort lies to the north-east of the resort close to Marbella while keen golfing enthusiast can also play at Golf La Dama de Noche, Aloha Golf Club, Las Brisas Golf and the Las Naranjas Golf Club. Puerto Banus has four main beaches which are Artola Beach, Nueva Andalucia Beach, Rio Verde Beach and El Ancon Beach. Puerto Banus is also the resort to visit if you want to experience the famous beach club culture on the Costa del Sol of which the Ocean Club, La Sala Beach Club, which was until recently better unknown as the Buddha Beach Club, Mistral Beach Club and Soul Beach. There are also some well known chiringuitos where you can hire a sun lounger from €5-€10 a day and enjoy a good variety of meals, snacks and drinks. Well worth mentioning are La Pesquera, Azucar Beach, Aurora Beach, Levante Beach, Plaza Beach, Astral Beach and Pedro’s Beach. Of course it almost goes without mentioning that there are several five star hotels in the resort of which according to the Trip Advisor the most favourably reviewed include the Club Jardines del Puerto, Sisu Boutique Hotel & Spa and the Pyr Marbella Hotel. Here guests can expect very high quality when it comes to luxury accommodations, meals and infrastructure. Of course there are also many self-catering apartments and villas to rent by the week starting from as little €350 for a seven night stay. Our handy interactive tourist map of Puerto Banus is best used as a tourist information guide as it shows some of the best sights, attractions, tourist spots, famous landmarks and places of interest in Puerto Banus. Alternatively use it as a street map to help you with driving directions and travel information, to and from Puerto Banus. On the map of Puerto Banus we show the locations of Puerto Banus’s best-known tourist attractions, sights, famous buildings, museums, galleries, parks, beaches, golf courses, tourist offices, markets, hotels, apartments and restaurants within Puerto Banus. As we can see from the map the A-7 passes through Puerto Banus, down the coast is LinDa Vista, San Pedro de Alcantara, Guadalmina with its golf club and Atalaya-Isdabe. Up the coast is Costa Marbella, the ‘Golden Mile’, Guadalpin-La Venta and Marbella. Surrounding Puerto Banus is Rio Verde, Nueva Andalucia, Concepcion, Naranjos, El Angel and Alomartes. The three top rated restaurants to dine out at in Puerto Banus include the Ikni Banus, Naga and Lamoraga. Puerto Banus has a night life to die for and night revellers won’t be disappointed. The venues to spend your nights and early mornings include Tibu, Seven, Dreamer’s Night Club, Olivia Valere, Tribeca 12, Funky Buddha, Dance Club Scream and La Cirque del Mar. Puerto Banus makes for a great day out if staying somewhere close by or if money isn’t an issue a great place for an expensive upmarket vacation. Whether you’re looking for a place to rent or to stay at permanently, you can take advantage of the services from the real estate agents in Puerto Banus who are more than willing to help you in finding your ideal residence. You can contact Banus Property (www.banusproperty.com, Tel.+34 951 307 567), Imperio Banus (imperiobanus.es, Tel. +34 952 810-303), Theresa Bernabe (www.theresabernabe.com, Tel. +34 951 319 545) and Chestertons affinity (www.affinitypropertygroup.com, Tel. +34 952 812 897). James, what would you say would be the advantages to living in Puerto Banus compared to other Costa del Sol towns? The main advantage is that Puerto Banus has an infrastructure like no other coastal town on the Costa del Sol. Literally everything you need is within a short walk, be it El Corte Ingles, Zara, masses of top quality restaurants, designer boutiques, the beach, Marina, Bars and nightclubs, luxury car showrooms, hotels – we even have an Iceland supermarket which sells lots of UK brands including Waitrose! It’s busy 365 days of the year too, meaning no matter when you visit you know there will always be a good atmosphere, and more importantly restaurants are open all year round! Would the area not suit certain types of people, i.e., are there any possible downsides? The Marina side of Puerto Banus (south side) can be a bit too busy for many people, however it is completely flat which makes living without a car extremely convenient. The mountainside of Puerto Banus (the North side of the A7 motorway) is a much more residential area and is much more suitable to families, plus property prices are a touch lower in this area. There are still a reasonably high proportion of Spanish located in the Marina. Most purchased properties here 25 to 30 years ago in the Marina, and are unlikely to ever sell! Roughly around 30% of owners are Spanish, with the remainder (roughly) being British, Scandinavian, US and Middle Eastern residents. In winter time we spend most weekends shopping in the area, and will often take a stroll along the Marina front and maybe take lunch or a coffee in one of the Marina front cafes. During the summer we will be on one of the beaches located either side of the Marina, both are extremely clean blue flag beaches and are child friendly, with lots of sun loungers and a great beach front Paseo (promenade) taking you east all the way into central Marbella, or west into the Spanish town of San Pedro – great for a walk or even better if you have mountain bikes! There are so many to choose from, but some of the best restaurants are La Moraga by Dani Garcia (opposite the El Corte Ingles store), a fabulous Argentinian restaurant named Tango which is opposite Antonio Banderas Square, and an amazing Italian restaurant called Los Bandidos, situated frontline to the Marina, next to the Louis Vuitton boutique. If you take a short stroll east of the Marina there is another absolutely stunning bar and restaurant named Les Cubes – you will not find a view (panoramic over the beach and sea) or menu like it and is by far the best restaurant in the area right now. Also, the bar/club named Pangea is also stunning, if you are looking for a later night out! Just behind the Marina located almost opposite the Bang and Olufsen store is a wonderful cocktail bar named Freudenhaus which offers by far the best cocktails in Marbella! There are masses of dentists in this area (hence the amount of perfect smiles in Marbella! ), and several doctors and pharmacies. Puerto Banus also has its own mini hospital, offering full helicopter emergency pickup! Shop wise, everything you need to live a normal day to day life can be found in the area. Close by you have a selection of beautiful villages, in particular La Quinta and the mountain Pueblo village of Benahavis – both are stunning! The closest international Schools are either Swans or Aloha College – both are amongst the best you will find in Spain, if not Europe. The closest Spanish private School is San Jose, ranking as one of the top private schools in Spain. The Marina has a big police presence, and any crime will usually take place after mid night in one of the Marinas many nightclubs. It is usually petty crime such as pick pockets, although most of the Marina now benefit from CCTV coverage and you will rarely hear of a property being broken into. Even noise levels are controlled in the Marina, so anyone caught playing music too loud, or revving an engine will find themselves in trouble. Prices in Puerto Banus having been rising dramatically since late 2014. We have seen Marina based properties (using a two bedroom as an example) rise from €160,000 in 2014 to close to €300,000 in mid 2016 (if you can find one!) Property in the Marina itself is becoming more and more scarce, forcing all buyers to search on the northern side of Puerto Banus (Nueva Andalucia), where prices have also seen dramatic moves positively in the last 2 years, and prices are still moving. Now is a great time to buy – but don’t expect a bargain if you want a Puerto Banus address! Every so often a bank repossession bargain will become available, but these are usually sold before they even hit the open market, and most vendors who were desperate to sell did so many years ago. Most of Puerto Banus has been somewhat ‘recession proof’ over the last 10 years, with certain developments seeing hardly any down movement in prices, and most are already way above peak market prices which we saw during 2006/2007. Rental wise the market in the Marina has gone crazy, so anyone wishing to purchase for investment cannot go wrong right now. There are many developments to choose from, covering all budgets. The best value properties in the Marina are within a development named Jardines del Puerto and Las Terrazas de Banus – here you can find spacious two bedroom properties from €285,000 with fantastic rental potential. Just outside the Marina and within a 10 minute walk to the beach we have another selection of two bedroom apartments starting at just €205,000! Differences will range from location (i.e.how close to the Marina they are located), security, onsite facilities such as Tennis courts, heated swimming pool, restaurant, but also interior square metres and terrace space, and of course what views the property may have – anything with a Marina view will be considerably more expensive than anything else for example. How much are the typical property prices in Puerto Banus for apartments, villas etc? As above, apartments will start at just under €300,000 for a 2 bedroom property on the Marina side of the A7 motorway, ranging to a cool €5,000,000 for a frontline beach apartment on the west side of the Marina. Villas are scarce in this area, but a frontline beach four bedroom villa which is 5 minutes walk from the Marina can range from €5,000,000 to €40,000,000! Any tips and advice to people looking to buy in Puerto Banus or surrounding area? Our biggest advice is to make sure you are viewing with a reputable agency. Many agents are now regulated in Spain and adhere to all European Real Estate rules and regulations and will solely work in the clients’ interest at all times, working from an official office as opposed to the back of a car or their lounge. The next best advice is to have a good look around the area with your agent, and make sure they show you all available options – this can easily be squeezed into one day and will give you a full view of the market. James, thank you so much for taking the time to help our readers with your experiences in Spain. If you want to contact him, you can find his details below.